Outside of the city Lübeck, we have a very beautiful place called the Brodtener Ufer (Brodten shore, Brodten steep coast). 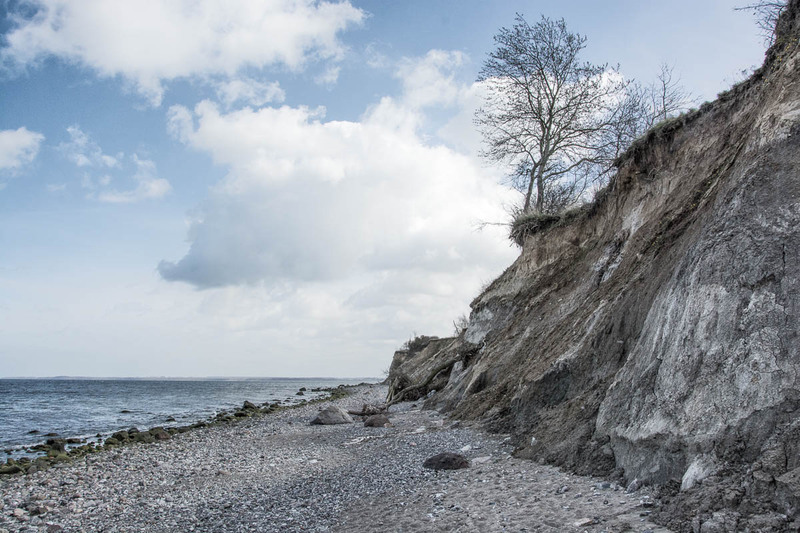 It’s a 4 km (2.5 miles) stretched steep coast that is part of the Lübeck bay. The steep coast is located between Lübeck-Travemünde and Niendorf near the small village called Brodten. Back then when I was in my twenties, I often visited the place with my friends in the evening on weekends. There was this one spot where people did make campfires, that’s what we did too. Nice memories, having the campfire warm up my face, my girlfriend on my side, a beer in the hand with friends around me that enjoyed the place as well. I played on my acoustic guitar and met people who played other instruments like bongo drums, or those who could sing. It was dangerous, but as young people do stupid things, we did go swim in the Baltic Sea at night in the dark and intoxicated. I still remember how a friend shocked us while we swam far away from the beach, he submerged into the sea and it took a very long time until he came up again. For a moment we all thought he drowned, but he just tricked us to believe that and laughed about us after he came back to the surface. We didn’t find this funny and he agreed that it was a stupid joke so that we did forgive him. It was a very relaxing place, we did either hang around with the other friends at the campfire, or me and my girlfriend walked away from there to have romantic moments together, and other couples seemed to enjoy the time out from the party too. Sometimes there was also drama, even at beautiful places. One morning, near the almost burned-out fire, a totally stoned stranger from a neighboring campfire started to make trouble with one of my friends. I told the stranger he should calm down but then he threatened to damage my guitar if I wouldn’t shut up. One of my friends got up and told him that he would eat sand if he’d come over here. Two of them did stand up and came closer, but my friend did hit one of them in the face when he came too close and that stranger now sat dreamy in the sand. The other guy now looked like frozen and dropped his glass hookah in the sand, and I couldn’t stop myself to destroy it with my feet and said that’s what happens if you want to damage guitars and the whole issue was solved before it started. We never went there to make trouble but we had this clear rule (that did count everywhere), if someone would get too close with the intention to beat one of us, we considered a preventative strike (laugh) if the signals were too clear. However, as said, most of the time it was a place where young people came together, where new friendships were made and where different people had fun together. I did especially like the fact that I could meet other musicians there, it was really interesting to make music together because everyone has the own music-style, and playing together the results can be very interesting. So, in my memories, the place is pretty much about making music, old friends and ex-girlfriends. I never hiked along the whole steep coast back then, that’s something I did much later. Thanks for sharing your happy memories of this place with us Dennis. I can imagine that there were many good times had around those campfires. It’s called getting older Dennis. I imagine that many of the friends you used to do that with have moved on in their lives but perhaps someday you will find other friends that would enjoy doing that once in a while, or maybe you have to be twenty. I don’t know. Perhaps they are. I think there should be more to life than work, study and chores but as you get older it is easy to get in. a rut and mske excuses not to do things. Last Thursday I took the train to Timmendorfer Strand and hiked from there along the coast to Travemünde where I took the train back home. That’s a very nice hiking tour. The small fishing harbor in Niendorf is charming too but very small. I have many more photos of the steep coast, as I couldn’t decide on my way… I think all scenes looked great and shot many photos. I might use some of the other pictures for later posts, or I edit them differently, or I create a gallery. Yes, during sunrise or at golden hour the place does even look more beautiful. It’s interesting to hear that young people still go there, but it’s not surprising that it’s still the to-go place for young people 🙂 Yep, that’s what we did there too, we were usually awake for the whole night, but some of us slept when they were too tired or too drunken (laugh). We did go bathe naked too back then, although at first I didn’t like that idea. Some couples started the idea and everyone said “Hell, yeah!” and they ran naked into the sea, that was strange at first. It was probably peer pressure for everyone but me and my girlfriend needed a bit more time to think about it and finally did it too. Today I am sure everyone did it right away to not be the last one at the beach to put off the clothes (laugh), as me and my girlfriend at that time, because as soon you as are in the water, it’s of course no big issue anymore, otherwise you will have all eyes on you. 😀 Funny times! Haha, I know what you mean, in the case of naked people at the beach, I’d probably put my camera into the bag too because they could think I am a stalker. I am generally a very shy photographer and in many situations I wonder what others could think. Since the steep coast is about 4km long, you could go further and find a spot without people. The whole shore there is beautiful, as said, so beautiful that you will take one and the same imagines again and again on the whole route (with same images I mean, you always have the sea on one side and the cliffs on the other side, but colours or surface might change and you can’t decide what looks best). Not sure if you saw the whole route, but at some point beach surface changes to “almost ankle-breaking” stone surface, and there are other hurdles like fallen trees.. that’s probably where you will find less people. PS: I will probably hike this area this year again. I read that there is a memorial stone for people that had a burial at see. But first i must find out where that is. I didn’t know that there is such a memorial, also I didn’t notice it. I hope you find it with help of Google. I saw several figures, sculptures, maybe one of them was about it but I paid attention to other things.